Summer is the season for harmful algae blooms in many U.S. lakes and bays. They occur when water bodies become overloaded with nitrogen and phosphorus from farms, water treatment plants and other sources. Warm water and lots of nutrients promote rapid growth of algae that can be toxic and potentially fatal to aquatic life and people. Eventually algae settle to the bottom and decay, depleting dissolved oxygen in the water, creating hypoxia – “dead zones” where oxygen levels are low enough to kill fish. As a senior scientist at the National Oceanographic and Atmospheric Administration between 1975 and 2003, I developed annual hypoxia forecasts for the Chesapeake Bay and the Gulf of Mexico – two of our nation’s water bodies most harmed by these blooms. At the University of Michigan, I helped develop harmful algae bloom forecasts for Lake Erie and continue to work with public and private organizations on these issues. States around Lake Erie and in the Mississippi River basin, which drains to the Gulf of Mexico, have been trying to reduce nutrient pollution for years. They rely primarily on voluntary steps, such as offering grants to farmers to take steps to prevent fertilizer from washing off their fields. In contrast, states around the Chesapeake have had more success with a federally enforced plan that can impose mandatory actions across the bay’s 64,000-square-mile watershed. From my perspective, when we compare these two approaches it is clear that voluntary measures are not even making modest dents in nutrient pollution. This year’s Lake Erie harmful algae bloom forecast has a severity index of 7.5 on a scale of 1 to 10. This is comparable to the three largest blooms since 2011, including one that made the city of Toledo’s tap water unusable for three days in 2014. The algae produced microcystin – a toxin that can produce effects from mild skin rashes to serious illness or death. 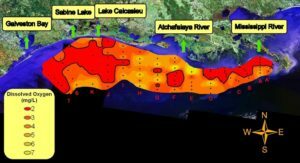 The Gulf of Mexico forecast predicts an 8,185-square-mile dead zone – more than four times the goal set by an intergovernmental task force. This will be the third-largest Gulf of Mexico dead zone since measurements began 32 years ago. The Chesapeake forecast predicts a 1.9-cubic-mile hypoxic region – nearly the volume of 3.2 million Olympic-size swimming pools. This is much larger than goals reflected in recent policies. Nonetheless, at least the Chesapeake is moving in the right direction. The amount of nutrients flowing into the bay is starting to decline. Lake Erie first suffered from heavy nutrient pollution in the 1960s. The Clean Water Act of 1972 triggered a remarkable cleanup. Nutrients, primarily from point (discreet) sources like sewage treatment plants, were cut in half, and the lake responded quickly. 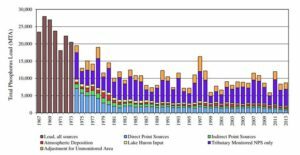 But harmful algae blooms and hypoxia resurfaced in the mid-1990s, probably because flows into the lake of a form of phosphorus that is readily used by algae tripled. The dead zone set a new record in 2012, and harmful algae blooms set records in 2011 and 2015. Even if blooms do not become toxic, they can have devastating effects. For example, the 2011 harmful algae blooms on Lake Erie cost the region nearly US$71 million in diminished property values, water treatment, and lost tourism revenues and recreational opportunities. In response, the United States and Canada negotiated new phosphorus loading targets that call for a 40 percent reduction from 2008 levels. Ontario, Ohio, Michigan, Indiana, Pennsylvania and New York are developing domestic action plans to meet those targets. Now however, 71 percent of nutrients entering Lake Erie are from non-point sources – mainly from agriculture. Non-point source pollution comes from diffuse sources, such as fertilizer washing off of farms and lawns, so it is harder to control. The United States contributes over 80 percent of Lake Erie’s total phosphorus load. In sum, major load reductions will have to come from agriculture, mostly from U.S. farms. How effective are voluntary measures? Governments generally are averse to imposing environmental regulations on farmland. As a result, most action plans for Lake Erie rely on voluntary, incentive-based programs to address nutrient loss from agricultural lands. But in the Mississippi River basin this approach has failed. In spite of more than 30 years of research and monitoring, over 15 years of assessments and goal-setting, and over US$30 billion in federal conservation funding since 1995, average nitrogen levels in the Mississippi have not declined since the 1980s. The task force leading this effort recently extended the deadline for its goal of a 1,930-square-mile dead zone from 2015 to 2035. Today the dead zone is more than triple that size. Our newly published modeling shows that it would take a 59 percent reduction in the amount of nitrogen entering the Gulf of Mexico to reach the task force’s goal. States around the Chesapeake Bay also struggled for decades to make voluntary, incentive-based approaches work. Their efforts were overwhelmed by the impacts of population growth and agricultural production. Frustrated by worsening conditions, the states asked EPA in 2010 to establish a total maximum daily load – a “pollution diet” within a regulatory framework under the Clean Water Act that limits the amount of nutrients and sediment that can enter the bay. Bay states and the District of Columbia then developed implementation plans and management strategies detailing how and when each jurisdiction would meet its individual goals. Unlike voluntary strategies, this approach has teeth. If states miss interim milestones for reducing pollutants, EPA can impose “backstop measures,” such as requiring additional reductions from point sources and withholding federal grant money. Agricultural groups, supported by 21 states outside the Chesapeake watershed, challenged the total maximum daily load in court but lost. Between 2009 and 2015, loads of nitrogen, phosphorus and sediment in the bay dropped by 8 percent, 20 percent and 7 percent, respectively. 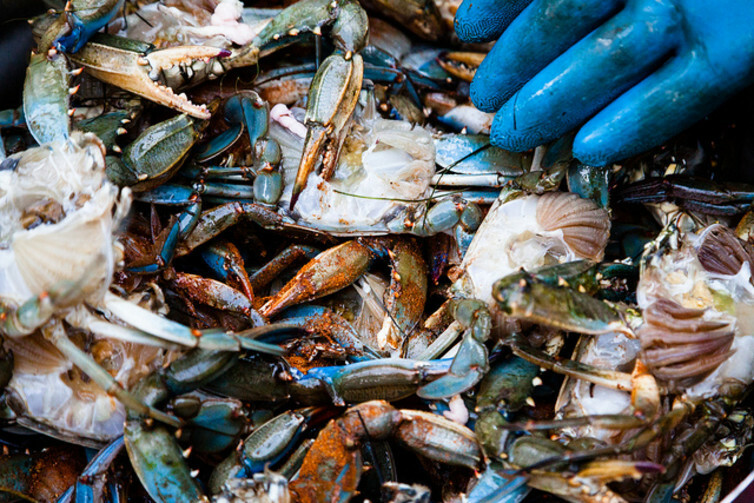 Underwater grasses and the bay’s iconic blue crabs are starting to recover. Michigan recently declared its portion of Lake Erie “impaired,” which is required to trigger a total maximum daily load. But Ohio declared only some of its shorelines impaired, and EPA concurred. So prospects for a recovery are slim. EPA’s web page calls nutrient pollution one of America’s “most widespread, costly and challenging environmental problems.” But voluntary action is not solving it. And President Trump’s EPA budget request would cut $165 million in grants to states to deal with non-point source pollution. As I have detailed before, taming nutrient pollution will require a broad national approach that includes steps such as modifying the American diet, changing agricultural supply chains and reducing production of corn-based ethanol. We also need to find the will to set legally binding limits when voluntary steps aren’t enough.